StarTree researchers based in the University of Padua, Italy, focused on the economics of non-wood forest products (NWFPs). They analysed existing statistics on international trade in NWFPs, showing the extent to which European countries (especially Western ones) rely on imports. They identified four products for which the EU was a leading trader & producer: chestnuts, tannins, wild mushrooms, and cork. NWFPs are not widely recognised as a distinct sector, which made their work much more difficult. They had to create new data cleaning methods, and they gave much thought to the definition of NWFPs – or “WFPs”: wild forest products. New data on NWFP supply chains was collected by StarTree partners in 14 different regions. In Scotland we surveyed the honey and mushroom supply chains. (And conducted an initial scoping study on venison – see “More venison, more trees?” in Reforesting Scotland Journal 52.) We are very grateful to all those who gave their time to help with this research. The survey, designed for use in all 14 regions across Europe, analysed the supply chain into producers, processors, wholesalers and retailers. (For mushrooms, “producers” meant pickers; for honey, the beekeepers were the producers.) This structure was difficult to apply to Scotland, as a high proportion of the companies are small to micro, with more than one function carried out by one company. The Scottish mushroom industry is not easy to survey. There is no official register of pickers or distributors, and no trade body. Pickers in particular may be reluctant to be interviewed, with concerns about their legal situation, about disclosing their part-time casual income, and about revealing their good picking areas. The data we gathered could be seen as a snapshot – fascinating, but incomplete. To survey the sector thoroughly would require a dedicated study with plenty of time to build relationships and snowball new leads. Beekeepers are much more inclined to talk about what they do! Due to the complexity of the questionnaire we were delivering, we interviewed by telephone, and could only survey a small proportion of Scotland’s estimated 4,000 beekeepers, so again the results were statistically incomplete. One qualitative finding was that they have many different business models – especially in terms of how they grade their honey and where they sell it. Another is that demand for honey is high: they can sell “every drop” that they produce. Supply chain results from all 14 regions were analysed to produce StarTree report D3.2: The regional markets of NWFP. Findings included: “a clear dualistic structure of the market with the main end-users situated in the western European countries and the main producing companies located in the East of Europe.” This usefully confirmed existing anecdotal impressions. A different perspective can be found in ‘Wild Mushrooms in Italy: from a commodity to a recreational service‘. Italian legislation in the 1990s portioned out harvesting rights for wild mushrooms. These restrictions on picking have not protected the Italian supply chain from competition from other countries, but they have promoted a situation where many Italians can enjoy picking mushrooms for their own use, often benefiting local tourism & service industries. There is a question here of values, and of what legislation and regulations are trying to achieve. The Institutions part of StarTree work was dedicated to such issues. Wild forest products supply chain and legislation highlighted another issue with wild-gathered food. According to EU law (General Food Law Regulation (EC) 178/2002, Article 18), all food sold should be traceable “at all stages of production, processing and distribution”. When the first step of a bulk supply chain is provided by anonymous casual pickers, this requirement is very unlikely to be met. This is a problem from the point of view of tax – and also, as emphasised by knowledgeable members of our own Startree stakeholder group, a potential public health tragedy just waiting to happen. If a restaurant cannot find out who picked the food they are serving, can they guarantee that picker’s knowledge of edible versus poisonous species? The ‘Wild forest products international trade‘ presentation concluded with a call for policy makers to remember that Europe’s bioeconomy is not only about huge quantities of biomass which shipped to feed centralised power stations or biorefineries. public-private initiatives in education, training and non-patented innovations. The StarTree project website has a page dedicated to the official reports on Economy and Marketing produced by the StarTree project. 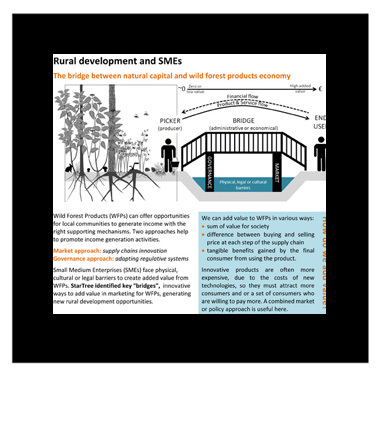 StarTree snapshot ‘Rural development and SMEs‘ looks at how people add value to wild forest products. Our survey of Tutors and Venues of wild forest product courses fed into this wider study. Respondents suggested a way to add more value in Scotland – create a directory of these courses!